Making its European debut at Paris, the much-anticipated production version of the Chevrolet Volt delivers up to 60 kilometers of gasoline and emissions-free electric driving, with the extended-range capability of hundreds of additional kilometers. 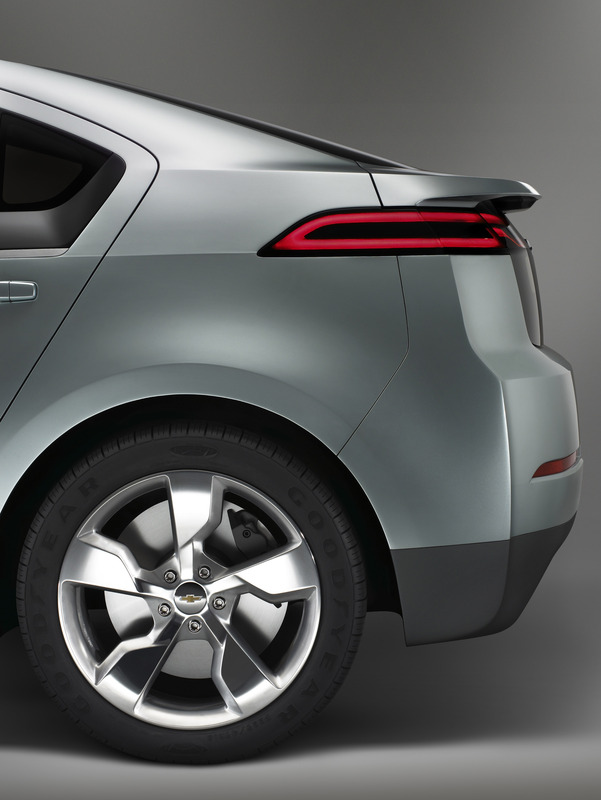 "The Volt is symbolic of GM's strong commitment to the future," says Rick Wagoner, GM Chairman and CEO. "It features just the kind of technology innovation that our industry needs to respond to today's and tomorrow's energy and environmental challenges." 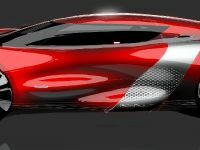 The design of the Volt production car has evolved from the original concept that was unveiled at the 2007 North American International Auto Show in Detroit. Because aerodynamics plays a key role in maximizing driving range, GM designers have created an aerodynamically efficient design for the production vehicle. Many of the design cues from the concept vehicle endure in the production Volt, including the closed front grille, athletic stance, rear design graphics, outside rearview mirrors and more. 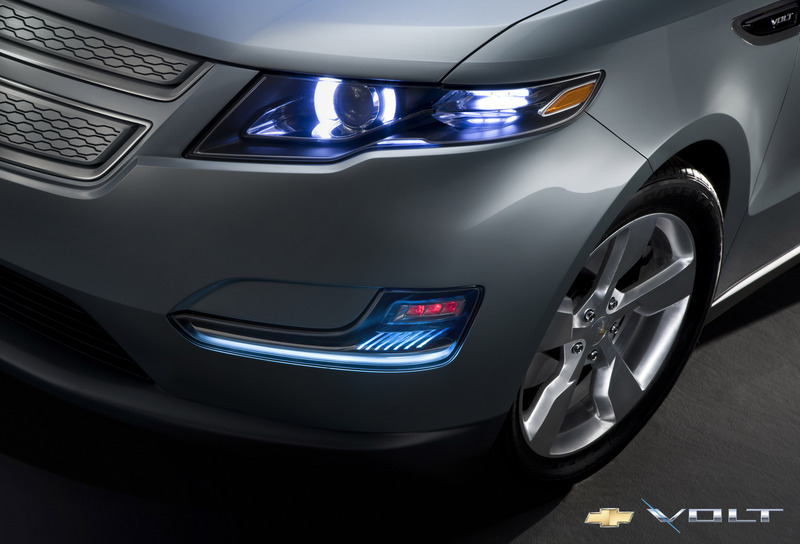 The Volt's rounded and flush front fascia, tapered corners and grille are functional, enabling air to move easily around the car. 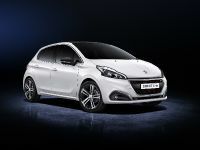 At the rear, sharp edges and a carefully designed spoiler allow the air to flow off and away quickly. An aggressive rake on the windshield and rear screen help reduce turbulence and drag. Working closely with GM aerodynamicists to shape the Volt, design and engineering teams have developed one of the most aerodynamic vehicles in GM's history. They spent hundreds of hours with the Volt in GM's wind tunnel, testing and re-testing parts such as the front and rear quarter panels, rear spoiler, side sills and side mirrors. 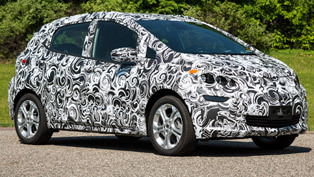 Aerodynamic improvements enabled GM to reach the Volt's target of driving up to 60 km (MVEG cycle) without using gasoline or producing emissions. 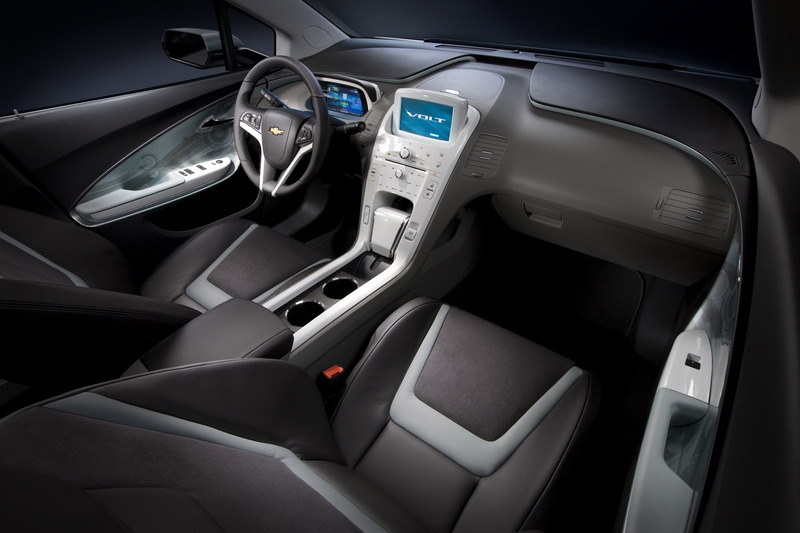 Inside, the Volt offers the space, comfort, convenience and safety features that customers expect in a four-passenger sedan, and it delivers them in a variety of interior color, lighting and trim options unlike any offered before on a Chevrolet sedan. Modern controls and attractive materials, two informational displays, and a touch-sensitive infotainment center with integrated shifter distinguish the Volt's interior from other vehicles on the market. The Volt heralds a new era in the electrification of the automobile by creating a new class of vehicle known as the Extended-Range Electric Vehicle, or E-REV. 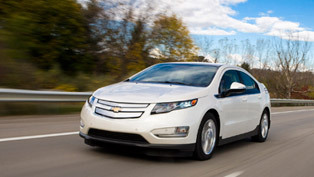 The Volt uses electricity to move the wheels at all times and speeds. For trips up to 60 km, the Volt is powered only by electricity stored in its 16-kWh, lithium-ion battery. When the battery's energy is depleted, a gasoline/E85-powered engine generator seamlessly provides electricity to power the Volt's electric drive unit while simultaneously sustaining the charge of the battery. This mode of operation extends the range of the Volt for several hundred additional kilometers, until the vehicle's battery can be charged. Unlike a conventional battery-electric vehicle, the Volt eliminates "range anxiety," giving the confidence and peace of mind that the driver will not be stranded by a depleted battery. The Volt can be plugged into a standard household 230v outlet for charging. The vehicle's intelligent charging technology enables the Volt's battery to be charged in less than three hours. Charge times are reduced if the battery has not been fully depleted. GM estimates that it will cost less than one euro at night for a full charge that will deliver up to 60 km of electric driving. On the road, the Volt offers spirited driving performance in a remarkably quiet interior. 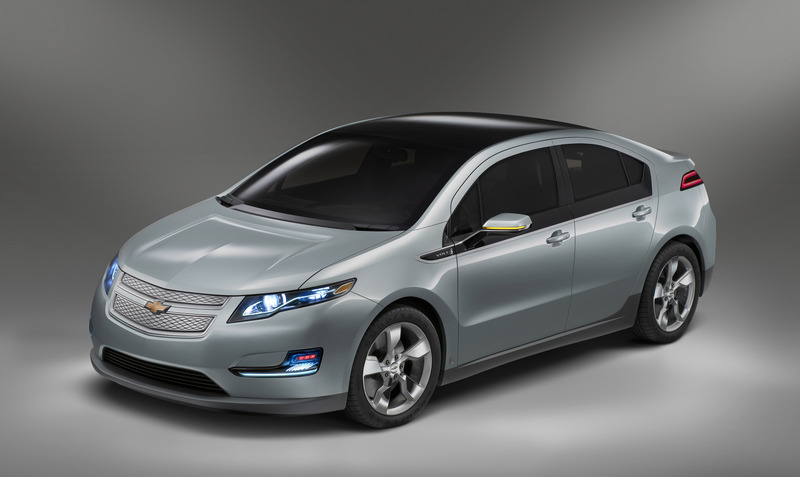 More than 220 lithium-ion cells contained within the Volt's battery pack provide ample power. The Volt's electric drive unit delivers the equivalent of 150 hp/110 kW, 370 Nm of instant torque, and a top speed of 161 km/h. The lack of engine noise, combined with special sound-deadening materials, makes the Volt an extremely quiet vehicle to drive. GM estimates that the Volt will cost about two euro cents per km to drive while under battery power, compared to 12 euro cents per km using gasoline priced at €1.50 per liter. 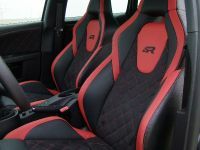 For an average driver who drives 60 km per day (or 22,000 km per year), this amounts to cost savings of €2,200 annually. Using night-time electricity rates, GM estimates that an electrically driven kilometer in a Volt will be about one-sixth of the cost of a conventional gasoline-powered vehicle. The Volt is expected to be built at GM's Detroit-Hamtramck manufacturing facility, subject to GM successfully negotiating satisfactory government incentives. 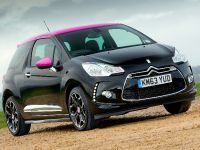 Production is scheduled to begin late 2010 for models in the United States. Pricing has not been announced. Visit media.gm.com/volt for more information. 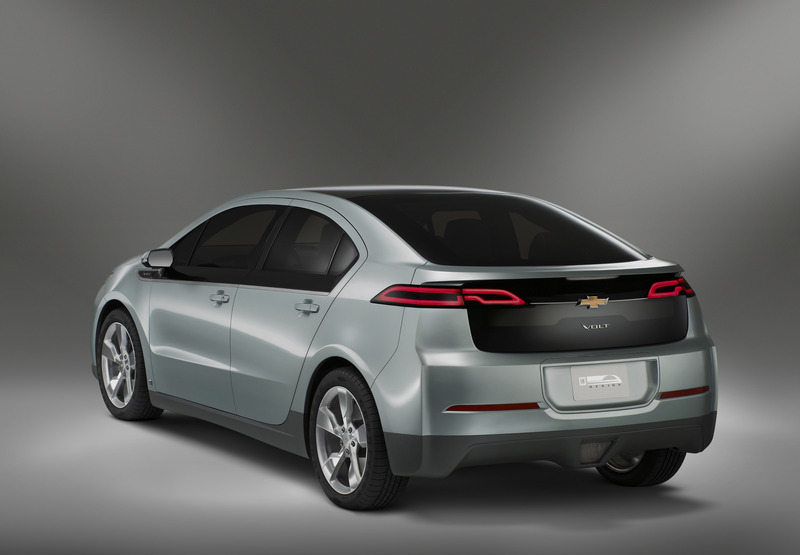 Chevrolet Volt: What is an E-REV? The 2011 Chevrolet Volt is a front-wheel-drive, four-passenger Extended-Range Electric Vehicle (E-REV) that uses electricity as its primary power source and gasoline as its secondary power source to propel the vehicle. 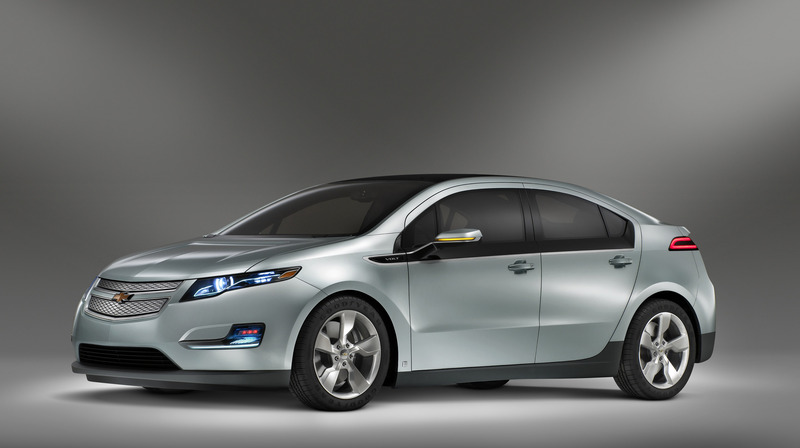 An E-REV like the Chevrolet Volt represents a significant departure from conventional hybrids. In a E-REV, the wheels are turned by an electric drive unit, whereas in conventional hybrids the wheels are turned by an electric motor, a gasoline engine, or both. For short trips, E-REVs will run on battery power alone. For longer trips, additional electricity can be supplied by an internal combustion engine or a fuel cell. 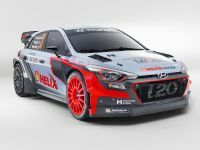 The battery and propulsion systems are sized so that when sufficient energy is available from the battery, the engine (or fuel cell) is not required for operation. 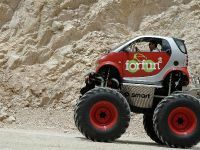 During this electric only phase of driving, the battery, motor, and power electronics are designed to deliver full performance, acceleration, top speed, hill climbing on electric power alone. The 2011 Chevrolet Volt is a front-wheel-drive, four-passenger Extended-Range Electric Vehicle (E-REV) that uses electricity as its primary energy source and gasoline as its secondary energy source to propel the vehicle. Energy is stored on board in a 16-kWh, "T"-shaped lithium-ion battery pack. 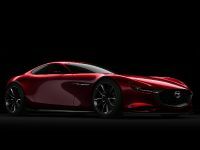 The battery pack powers the electric drive unit, which is capable of meeting full vehicle speed and acceleration performance while driving the car electrically for up to 60 kilometers (based on MVEG city cycle) without a drop of gas. For longer trips, the Volt's on-board range-extending engine is used to drive an electric generator when the battery's energy has been depleted. 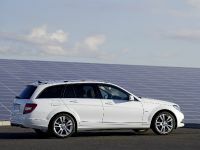 The range extender, which can be powered by gas/E85 Ethanol, is able to generate additional electricity to power the car for hundreds of miles. The Chevy Volt will use no gasoline and produce no emissions for up to 60 kilometers of daily driving, helping to save approximately 1,900 liters of gasoline a year (compared to a similar sized vehicle that averages 7.8 l/100 km). GM estimates that drivers who travel 100 kilometers a day (more than 33,500 kilometers miles per year) could save about 2,100 liters of gasoline annually (compared to a similar size vehicle that averages 7.8 l/100 km). 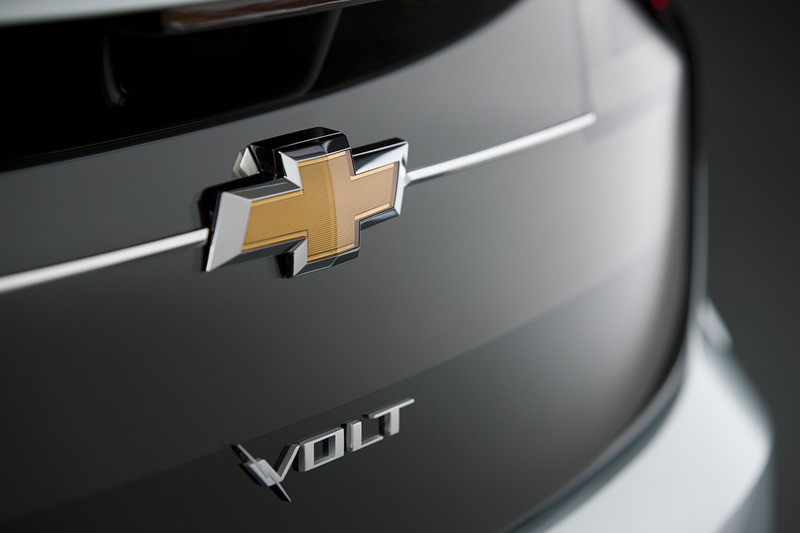 The Chevy Volt operates differently from all other propulsion systems. An electric drive unit (electric motor) drives the wheels at all times and at all speeds. 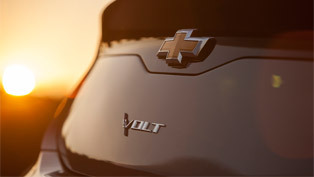 The Volt's range-extending engine serves only to create electricity to power the vehicle beyond 60 kilometers. 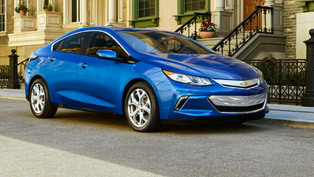 Depending on the drive cycle, an E-REV like the Chevy Volt will eliminate most initial engine starts and substantially reduce associated vehicle emissions. 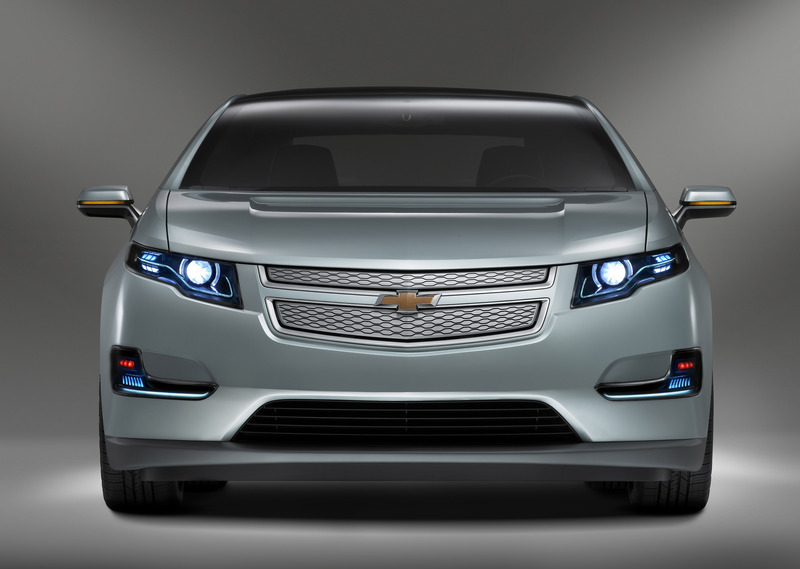 Thanks to instantaneous torque, the Chevy Volt will be a fun-to-drive car with quick acceleration. At current prices per kilowatt hour, GM estimates that an electrically driven kilometer in a Chevy Volt will cost about one-sixth compared to a conventional gasoline vehicle. It is estimated that it will cost about 0.02 euro per kilometer to drive electrically vs. 0.12 euro using gasoline at current prices. 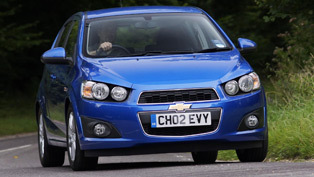 Most Chevy Volts are likely to be charged off-peak in the evening or overnight when consumption is lower, potentially further reducing the cost of recharging. Charging the Volt about once daily will consume less electric energy annually than the average home's refrigerator and freezer units. 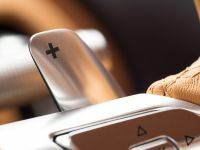 At a cost of about 1 euro a day for a full charge that will deliver up to 60 kilometers of electric driving, for most owners the Volt will be less expensive to recharge than purchasing a daily cup of your favorite branded coffee. The beautiful aerodynamic design of the Chevrolet Volt production car helps to improve both fuel economy and driving performance. 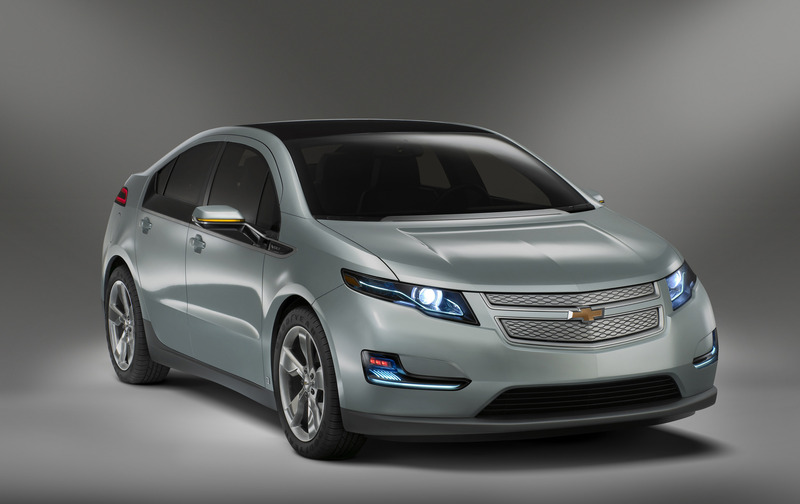 GM's Board of Directors approved the production of the Chevrolet Volt. 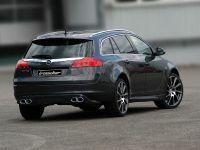 The targeted launch date is late 2010 as a 2011 model.